Business Plan for Pharmaceutical Manufacturing Unit. Abstract: Experience is key aspect for starting any type of business. Without experience, it’s like jumping from a mountain without any safety procedure. Pharmaceutical manufacturing unit requires technical skill to set-up. For pharmaceutical manufacturing unit, we have to consider two laws and regulations. It should meet all requirements according to Factory Act. If you want to check list of documentations that are necessary for starting pharma manufacturing company read at out article: How to start pharmaceutical manufacturing Unit? Location and Surrounding:Plant should be situated at location and surrounding that prevents any contamination and mixing of any external substances. Plant should be well connected to road and should easy availability of transportation, courier and cargo. Adequate supply of water and electricity is essential for smooth running. Environment should be clean and free from air pollution. Proper sewerage system should be connected to plant for drainage of wastage. If possible, plant should be located not far away from market for easy availability of items in need and emergencies. Men force factor should also consider while finalizing location for plant i.e. availability of trained or skilled man power, labour and industrial legislation and cost of living etc. Manufacturing unit should not be as far, it create labor and staff availability problem. Climate factor also affect selection of location. Extreme climate change like heavy rain, temperature, humidity, earth quake should be considered while selecting location for pharma plant etc. Investment for land and Building may depend at many factors like location, area, state, material used etc. Land and building may be own or rented. At prime location cost of plant may be much higher side where as at backward area, it may be less. If we want to prevent investment of land and premises, we can start with rented premises. Both Rented and Owned premises has its own pro and cons. Here we are not discussing at this matter. Rented premises may prevent start-up time and cost but rented premises should compile with Drug and Cosmetic Act & Rules. Each section requires minimum area (as prescribed) for proper functioning and easy processing. If possible premises or building without partition is best for new starting. We can make partition accordingly. Need of architect or expert for setting-up premises depends at our experience level. In pharmaceutical, we need to get approval from Drug Department before starting manufacturing of any dosage form. There is also mention about premise specification for the premises used for manufacturing, packaging, processing, stocking & ware housing, labeling and testing purpose. Premises should be have adequate area for work station, machinery implementation, movement of personnel and material, easy processing of all manufacturing processes carried out in same area. Main purpose of Schedule M is to prevent any contamination and manufacturing of quality products. Every section needs different space for setting-up manufacturing of that section as per Drug and Cosmetic Act & Rules. For External Preparation, minimum of 30 square meter is required for basic installation and 10 square meter area for ancillary. For Liquid preparation, minimum of 30 square meters are required for basic installation and 10 square meters for ancillary. For Tablet Section, minimum of 60 square meters for basic installation and 20 square meters for ancillary for uncoated tablets. For Capsule Filling Section, minimum of 25 square meters are required for basic installation and 10 square meters for ancillary area. For Powdered Section, minimum of 30 squares meter is required for basic installation and 10 square meters for ancillary. Plant layout should be such that it should avoid or minimize the risk of errors and provide easy cleaning and maintenance. Plant layout should prevent cross contamination that result in adverse effect at quality of product and safety of the personnel. Plant layout should be designed that it should be easy to clean, maintain and operate. Design and layout of premises is so that it prevents entry of insects, pests, birds, vermins and rodents in the premises. It should avoid any mix-up or cross contamination of raw materials or in process material. Entry of visitors should be restricted to visitor area. Clock wise or anti clock wise flow chart concept is best way to avoid any type of contamination and men-material flow. Flow chart of material is so that it should avoid any process delay and cross contamination. Electricity supply room should be situated outside factory premises to prevent any short circuit and mis happenings. Proper safety procedures like sand baskets, covering of transformer and wires, water outlets etc should be maintained. 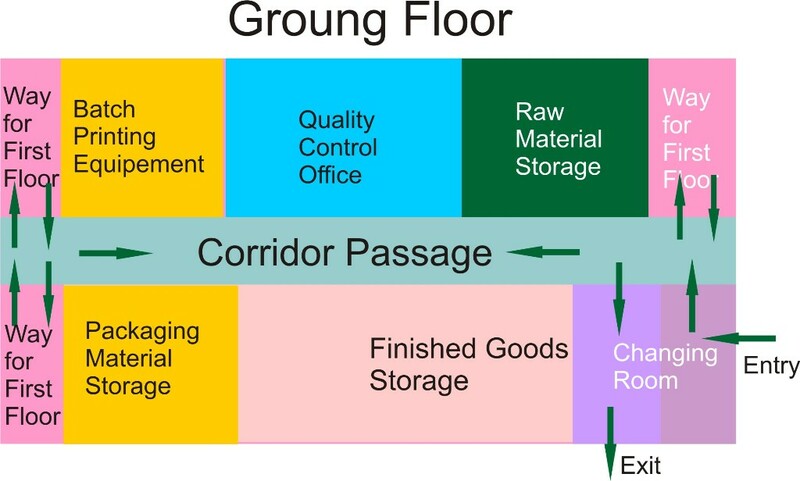 Ground Floor: Raw material Storage room, Packaging Material Storage Room, Finished Goods Storage room, dispensing and weighing section, Changing Rooms for staff and workers, visitor room etc is best suitable sections for ground floor. Racks should be used for placing raw materials. Each raw material should be well labeled and testes, under test, rejected, approved raw material should be placed separately. 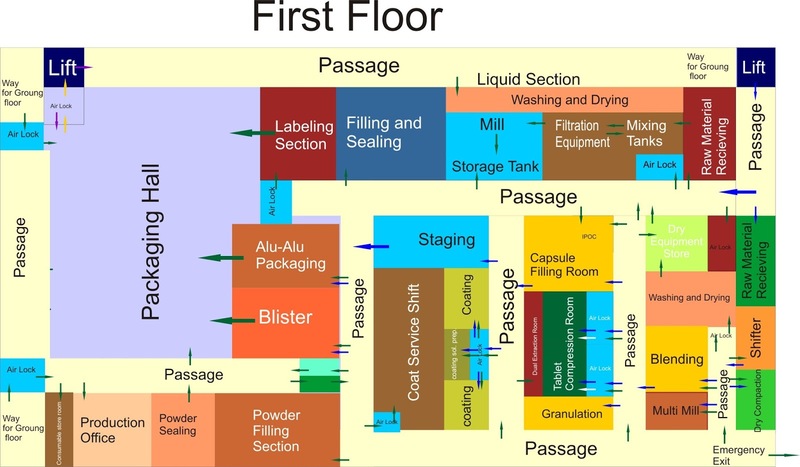 First Floor: First floor is best suitable for all manufacturing processes. Estimated Plant Cost:Total estimated plant cost depends at capacity of plant and area covered. It is difficult for calculating estimated plant cost. A pharmaceutical manufacturing plant is costlier project and requires number of formalities to be fulfilled for getting approval from drug department. Here we are trying to give find out brief estimated cost for setting-up pharmaceutical manufacturing plant. This estimated is for informational purpose only and can’t be consider accurate due to any change in cost of land, machinery, salary, rent, premises & building etc. Cost of machinery we are considering as per idea of cost we received from few manufacturers. Land/Building/Premises (If owned): Depend at location, here considering 35 lakh of value including building. Rent (If not owned): 20000-40000/- per month (Depend at location). For Liquid Plant: Approximately Small liquid plant cost could be six lakh to 12 lakh. For Tablet and capsule manufacturing most of equipments will be same except tablet punching machine and capsule filling machine. For powder section, we can also use similar equipments like cone blender, mass mixer etc. Air conditioners and Air compressors will be cost approx. sixty thousand. Blister packing machine is nearby two lakh. Alu-alu machine is costlier one and could cost approx. twelve lakh. Semi automatic Capsule filling machine is nearly ten lakh. Tablet punching machine will also cost approximately five lakh. Labor safety and security is must during manufacturing process. All staff and workers should be dressed accordingly. Workers should have working clothes, industrial boots, gloves, caps, spectacles, mask and others requirements during working. No worker or staff member should be allowed without proper precaution to prevent any contamination and health related issue. Raw materials used in pharmaceutical sector may cause adverse effects at health of workers if it comes in contact with their skin or inhaled by them. All dangerous machineries or equipments should be red marked with warning massage. Rest room and canteen should be situated outside work station. First aids box and medical aids should be available for preventing any emergency. Medical check-up at interval of six months should be conducted.